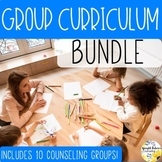 Included in this bundle of 61 pages are the following lessons: 1 – Advocating – Standing up for yourself. Example – You are waiting in line at the grocery store and someone cuts you on line. 8 scenarios, 2 pages. 2 – Banking Role plays – (Review of necessary prerequisite vocabulary is required). 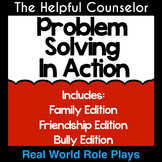 This product contains 5 role-play scenario task cards and notes to the teacher. 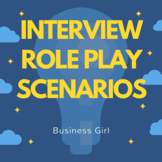 This activity provides scenarios for students to act out when covering interviews and careers. Please see the Preview for Teacher Notes. Ask for 5 student volunteers. You will have one interviewer and four interviewees. 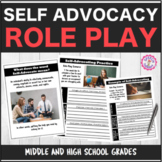 These role playing scenarios will help your class act out some situations that arise in the classroom. Very effective in active classrooms and can be great for improving class behaviour. Do your students need practice speaking in medical situations? 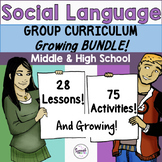 Then download this worksheet for six (6) dialogue scenarios for teen to adult English students. 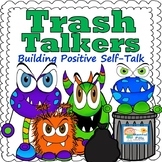 Situations include: booking a doctor's appointment, filling a prescription at a pharmacy, making a 9-1-1 call and more. Scenarios for students to act out and to have a discussion about how to show respect in difficult situations. This purchase is for 8 role play cards. The cards lay out 8 different friendship related scenarios that may occur in an elementary school. 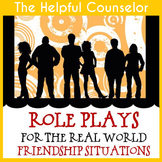 They can be used as discussion starters or to be role played. Specifically related to sharing friends, what to do when our feelings are hurt, etc. English/ESL students love conversation practice. These real-world financial scenarios are designed to get students to use money vocabulary while enacting every day situations involving currency exchange, banking, lending, and more. 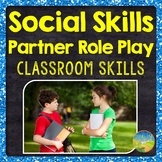 This is 5 free additional role play scenarios for the social skills lesson, "Joining a Conversation." Enjoy! 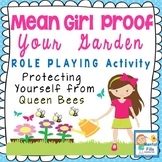 Summer is a wonderful time for children, but it can also be a time when some problems may occur. 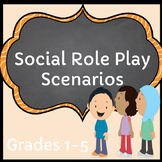 Have cooperative groups choose from these 6 scenarios, research the solutions, and act out the solutions through role-play. These just might save a life. 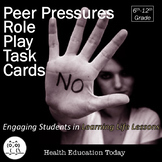 Health Lesson: Peer Pressure Role-Play Task Cards Activity!